This article explains how to perform insert, update and delete operations in ASP.NET GridView with Entity Framework. Let us take an example to perform CRUD operations using Entity Framework Database First approach. Suppose we’ve to work on Customer table having CategoryID as foreign key. Select your database and Set “Save Entity connection string in Web.config as” option true giving name SampleEntities. Give Model Namespace and click on Finish. We’ll use ASP.NET Gridview Footer row for inserting record, inbuilt way to edit and delete records. <asp:GridView ID="gridSample" runat="server" AutoGenerateColumns="False" ShowFooter="True"
<asp:LinkButton ID="lnkEdit" runat="server" Text="" CommandName="Edit" ToolTip="Edit"
<asp:LinkButton ID="lnkDelete" runat="server" Text="Delete" CommandName="Delete"
<asp:LinkButton ID="lnkInsert" runat="server" Text="" ValidationGroup="editGrp" CommandName="Update" ToolTip="Save"
<asp:LinkButton ID="lnkCancel" runat="server" Text="" CommandName="Cancel" ToolTip="Cancel"
<asp:LinkButton ID="lnkInsert" runat="server" Text=""  ValidationGroup="newGrp" CommandName="InsertNew" ToolTip="Add New Entry"
<asp:LinkButton ID="lnkCancel" runat="server" Text="" CommandName="CancelNew" ToolTip="Cancel"
Display="Dynamic" ErrorMessage="First Name is required." ForeColor="Red" SetFocusOnError="True"
Display="Dynamic" ErrorMessage="Last Name is required." ForeColor="Red" SetFocusOnError="True"
Display="Dynamic" ErrorMessage="Email is required." ForeColor="Red" SetFocusOnError="True"
<asp:RegularExpressionValidator ID="valRegEmail" runat="server" ErrorMessage="Invalid Email"   ValidationGroup="editGrp"
<asp:RegularExpressionValidator ID="valRegEmailNew" runat="server" ErrorMessage="Invalid Email"   ValidationGroup="newGrp"
Display="Dynamic" ErrorMessage="Category is required." ForeColor="Red" SetFocusOnError="True"
First, import model namespace and bind customer entities to gridview. One thing, Footer template will not be displayed when no data is present. But, we need to display footer for inserting records. we’ll add a dummy row and clear it by coding to display footer row. We access category dropdown (in footer row and during editing) and bind to category data in RowDataBound event. BindGrid method is called in page_load event. We will get data from footer controls, create new object and use the EntitySet<T>.AddObject method for adding newly created objects. When context.SaveChanges() is called, EF goes ahead and inserts the record into the database. 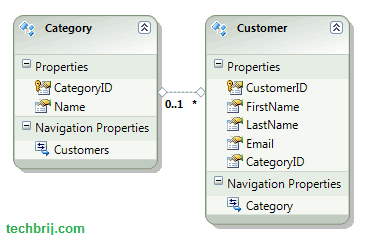 We get customerID from datakey of gridview, get Customer object using customerID, modify data in customer object and call SaveChanges to apply on database. We use DeleteObject method to delete object and SaveChanges to reflect it on database. Please help by providing additional code and help. Please, could you give me some help? Is it possible that you post whole solution so it can be downloaded?